A daughter of a friend of mine is getting her new and first credit card. She has applied for one and is now waiting for it to be approved. 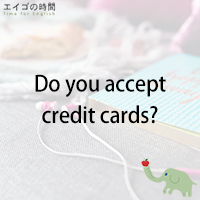 As an English learner, you probably want to learn how to ask if you can use your credit card in shops and restaurants. You can simply ask by saying, “Can I use a credit card?” Can I use a credit card? Or you can also say, “Can I pay by credit card?” Can I pay by credit card? Just always remember: When you use your credit card, you’re using borrowed money. Now, would you like to practice together? I’ll read an example sentence, so please repeat after me. Ready? 同じ質問を主語を変えてあちら側の立場から問う方法もあります。この場合、使う動詞は主に二つ、acceptまたはtakeです。Do you accept credit cards? または Do you take credit cards? 具体的なブランド名に言及することもあります。例えば、「アメリカンエクスプレスは使えますか？」なら、Do you take American Express? です。VISAやMastercardも同じです。Do you take VISA? Do you take Mastercard?